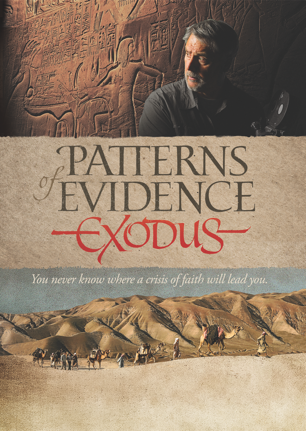 I was interested in Patterns of Evidence, Exodus as a review to be able to show the teens that gather here in my home, show them the physical evidence that the Bible is true, historically, with quite a bit of archeological evidence to back it up. I had no idea that the tables had turned 50 years ago, so much so that now the majority of the archaeologists and historians do not believe that there is any ANY hard evidence for the Israelites to even have been anywhere near Egypt, to have had a need to leave, or Exodus. I think I watched the entire first half of the movie with my jaw dropped as expert after expert explained away why the Bible story isn’t true. Dates, places, digs. I was astonished. It was compelling to watch, and hear how it can all be explained away. After hearing what Timothy Mahoney was up against, the tables turned, as he walked the same places, filming, interviewing, and looking at the timeline with better clarity. The excerpt below says that “This scientific documentary’s goal is to communicate the TRUTH of the Bible and help equip believers with defending their faith and the Bible. “ We no longer live in an age where people believe, that even historically, the stories in the Bible are true. In my day as a teen, the flood, creation, and revelations were considered unbelievable. Now, the entire thing is. I think this is an excellent film for all ages. Specifically if you are like me, a bit older, and grew up seeing the evidence, archeology, artifacts, etc point towards verifying the historical data in the Bible. It is hard to wrap your mind around how the last 50 years has wiped that away, and you’ll see the struggle if this generation to believe in the facts. If they can’t believe in the facts – how will they make the turn to believe in a person who came from this line, who died for their sins, and offers Kingdom Victory Living today? Comment below to enter. You’ll enjoy it. This entry was posted in Movies, Reviews and tagged #PATTERNSOFEVIDENCE and #FLYBY. Bookmark the permalink. This is so educational for us and our families.. This Dvd will be such a blessing! Really glad to see a video taking on this issue!